The Way of Saint James pilgrim’s shell signs. 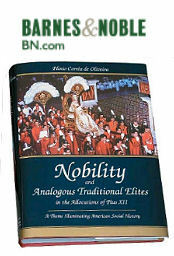 There were times when a pilgrimage to Santiago was a dangerous undertaking. Thieves, murderers, and highwaymen assaulted defenseless pilgrims. 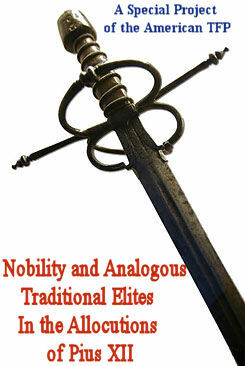 To ensure the pilgrims’ safety, the Church fostered several groups, including many orders of chivalry. The Knights of Santiago, the Knights Templars, the Knights of Saint John of Jerusalem, and the Knights of the Holy Sepulcher all took part in this charitable task and dotted the pilgrimage route with their beautiful churches. In the daily routine of the walk, one feels like part of a large family. 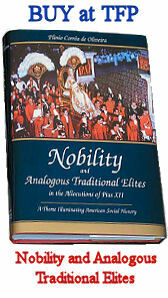 Inspired by authentic Christian charity, the pilgrims help one another and share interesting experiences. One of the most picturesque occurred while I was crossing the dry and dusty plains of Palencia. I met a young couple who could barely walk after many hours in the sun. Though they had suffered much, they exuded a special joy that is born of sacrifice endured for the love of God. They said they had been married a week before and to obtain special graces of God for their life together they had decided to spend their honeymoon walking to Santiago de Compostela, certainly, an unforgettable and inspiring beginning for a marriage. 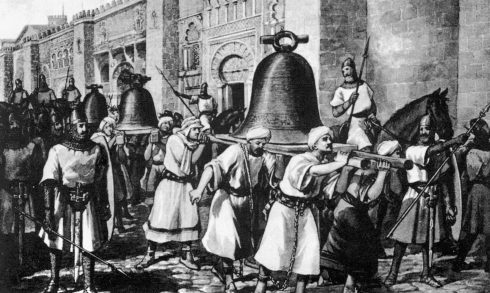 When Al-Mamsur conquered Santiago de Compostela and razed its church, he forced the Catholics to carry the large church bells to Cordoba, his capital. Years later, St. Ferdinand re-conquered Cordoba and obliged the Moslems to return the same bells to Compostella. Another family, from Andalusia, had begun their walk in Seville to fulfill a promise. 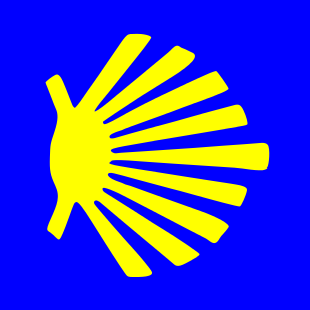 That very traditional route, crossing Spain from south to north, was established by Saint Ferdinand of Castile himself. The story goes back to the tenth century, when the Moslem troops of Almanzor destroyed the church that housed the body of Saint James without actually damaging the relics. The Moslems’ fury was not satisfied with just the destruction of the church. History recounts that Almanzor had his horse drink from the Baptismal font and afterwards ordered the Christian prisoners to carry the bells of the church to Cordoba to be used as lamps in his mosque. When Saint Ferdinand conquered Cordoba 250 years later, he recovered the bells and had them returned to Santiago in the manner in which they had came to Cordoba, this time on the backs of Moslem prisoners. The pilgrimage provides ample opportunities to stop and talk a bit, often with the accompaniment of a good wine. 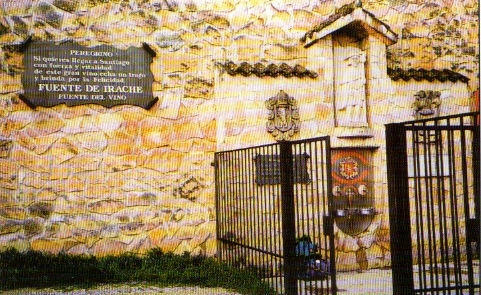 Close to the Benedictine monastery of Irache, which dates from the tenth century, there is a welcome fountain that serves to quench the thirst of tired pilgrims, not with an excellent water, but with a superb wine! It is the only such fountain in the world, ideally suited “to gladden the heart of the pilgrim.” One often encounters such curiosities during the walk. One also hears fascinating stories of saints and miracles. Upon reaching the beautiful city of Santo Domingo de la Calzada, named in honor of an enthusiastic and saintly helper of pilgrims, I was amazed to see and hear a caged rooster and hen in a prominent place in the cathedral. That definitely not being something I am accustomed to, I quickly inquired about it and learned that it was a reminder of a magnificent occurrence in this town during the Middle Ages. I was pleased to learn another day that the convent of Claretian nuns I was visiting in Carrion de los Condes had lodged Saint Francis of Assisi on his way to Santiago and that the road I was on had been built by Saint John of Ortega in the eleventh century. That saint had accompanied Saint Dominic during his apostolate with the pilgrims and had helped build bridges, hospitals, and churches. His body lies in a sanctuary dedicated to him in the province of Burgos. It was there that I received one of the greatest graces of my entire pilgrimage. On arriving, I was surprised to see so many buses, cars, and people. I knew the shrine was famous as a place of pilgrimage for women with fertility problems — Queen Isabella the Catholic herself made a pilgrimage there after seven years of fruitless marriage. I also knew that the parish church was well known for the excellent soup it provided free of charge to all pilgrims. But that was not the reason for such a gathering. It was March 21, the first day of spring. 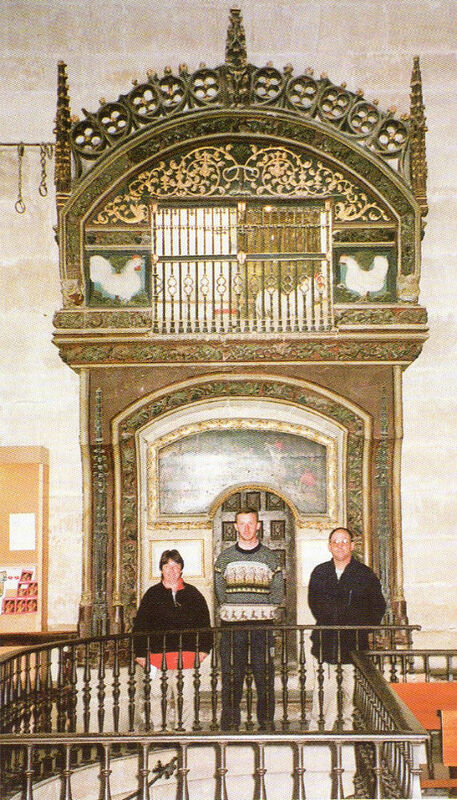 Inside the Cathedral of Santo Domingo de la Calzada, where the rooster crowed after being roasted. At the top, middle section lives the rooster and hen. The multitude filled the inside of the Romanesque church to witness a spectacle that occurs just twice a year, “the miracle of light.” Next to the main altar stands a column crowned with a twelfth-century roman capital that experts consider one of the most splendid in the world. This capital depicts in beautiful relief Saint Gabriel’s annunciation to Our Lady, Saint Joseph’s dream, and Our Lord’s nativity. Around six in the afternoon, as the light of the setting sun enters the church, one ray of sunlight streams through a small spot in the window illuminating the nave. This small stream of light slowly grows in size and intensity until it reaches the figure of Saint Gabriel. It then begins to shine on Our Lady, illuminating Her entirely. The analogy with the Incarnation is striking. Gradually the entire capitol, with its figures of Saint Elizabeth, Saint Joseph, and the Nativity, is bathed in light. A special grace suffuses the ambience, and no one dares utter a word. The priest told us that even if spring begins with stormy weather, March 21 is always sunny with a clear blue sky. The same occurs every September 21, the autumnal equinox. Medieval ingenuity shines brightly in this, clearly refuting those who denigrate the Middle Ages. One of the virtues that God really puts to the test during the walk is the virtue of patience. The pain comes and goes, but the trying aspect of the pilgrimage does not. One walks for many hours each day, yet the goal often seems ever further away, so one can well imagine my feeling when, having logged more than 240 miles, I encountered a sign saying that Santiago was still 300 miles away! The hardest part of the walk came on the ancient Roman road still used today between the cities of Carrion de los Condes and Calzadilla de la Cueza in the province of Palencia. It is a ten mile stretch of true monotony and barrenness. Not a single house, not a single person, not a single tree, serves as a reference during hours and hours aggravated by unexpected rain and wind that comes from nowhere and throws the dust and dirt into one’s face. I almost had to crawl on all fours to get through it. 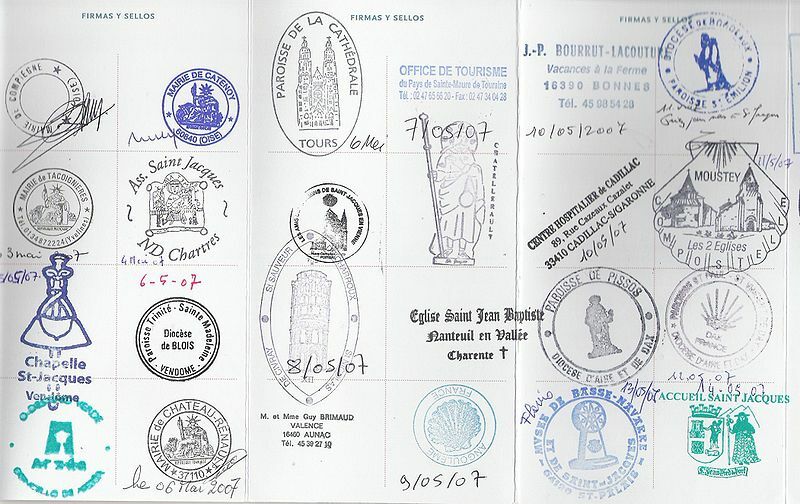 Picture of St. James stamps in France, stamped in “Way of St. James” pilgrim passport. “I don’t understand why you would be out here walking in such conditions. 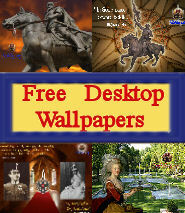 You must be half crazy,” said a less than charitable woman. Her remark was in marked contrast to the usually very warm hospitality one frequently encounters. Families run hostels for pilgrims all along the walk, and each family member has a duty. The lady of the house cooks, the husband manages the place, and their daughters treat the pilgrim’s wounds without asking for any return. One very picturesque elderly lady has been offering a handful of figs, cold water, and old stories to the pilgrims for more than 50 years. For each pilgrim passing by her home in Lorgnon, she drops a pebble in a bucket.